One horned Rhinocerous (Rhinocerous unicornis) is highly threatened Mammals species listed in Appendix I of the Convenction on International Trade in Endangered Species (CITES). It was categorised under Endanged species by Internationa Union for Conservation of Nature (IUCN) until it's single population reached to relative recovery in Kaziranga NP (India) and down listed to Threaten in 2008. Five species of Rhinocerous are surviving in the world at present among them three are in Asia namely: greater one horn rhinocerous, javan rhinocerous (Rhinoceros sondaicus and sumatran rhinoceros (Dicerorhinus sumatrensis) and African rhinoceros are black rhino (Diceros bicornis) and white rhinoceros (Ceratotherium simum). In past the flood plains of Ganges, Bharmaputra and Indus river nearby the foothill of Indian sub-continent in between Indo-Mynmar border in the East and Shindu river basin (Pakistan) in the West once it is believed spreading throughout but at present one-horned rhinoceros is confirmed in north East part of India and low land of Nepal. Among the most endangered species in the world Greater One horned Rhinocerous ( Rhinocerous unicornis) was conserved with majore priorities in collabration with the involvement of various conservation partners around the world. Local communities, conservation NGOs, government agencies and the police and army are the contributors for the collective Rhino Conservation Efforts, which begins to give bear a fruit that we are celebrating 3rd zero poaching year (2011, 2014 and 2015) under the Hariyo Ban program conducted in Nepal. Hariyo Ban is named after the popular Nepali Saying "Hariyo Ban Nepal ko Dhan" that means "Green Forest is the Wealth of Nepal". Hario Ban Program main objective was to reduce the threat on Biodiversity on Terai Arc Landscape (TAL) and Chitwan Annapurna Landscape (CHAL), including focal species such as rhino. Rhinocerous types of large mammals are of great challenge for conservation and it's populations is fluctuating ups and down mainly due to political unrest since 1950 during the period country faced rampant poaching of rhinocerous. 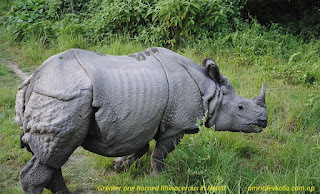 It is belived that around more than 800 rhinocerous were present in Chitwan Valley until 1950 which get reduced to less than 100 as early as mid-1960. So, to protect the remaining rhinocerous Government of Nepal declare Chitwan National Park (CNP) as the first National in 1973 and reached population of Rhinocerous 612 in CNP in 2001. Government reintroduce 87 Rhinocerous to Bardia National Park (BNP) and Shuklaphata Wildlife Reserve (SWR) in between 1986 to 2003 under the technical support of National Trust for Natural Conservation (NTNC). In Chitwan, Rhino were dropped to 372 in 2005 and in Bardia to 31 in 2007 after a decade long armed conflict when rhinos were heavily poached. But since the peace process was iniciated in Nepal Rhino number are recovering well and reached 534 in 2011 and 645 in 2015 at present distributed in Chitwan, Nawalparasi, Bardia and Kanchanpur district.